From lamb and fermented shark to skyr and ice cream, it’s no secret that Iceland looooves animal products. So what is a vegan to do?! Don’t worry friends, I’m here to help! Disclaimer: I am NOT a vegan or a vegetarian, so I am NOT an expert on this topic. However, like any good travel blogger, I’ve researched the following information to bring it to you! With that being said, don’t know the lingo. I’m also combining vegan and vegetarian in this video – you’ll hear why. I know how important it is to eat the way you want, even when on vacation. I’m a traveler myself and even though I’m not a vegan, I like to make sure to have healthy options when I travel. So I hope this video empowers you to have the best Iceland trip ever, even when it comes to eating! According to Icelandic customs, you are allowed bring up to 3 kilograms or 6.5 pounds of food into Iceland. This excludes raw products such as eggs, raw meat, or dairy. Kronan has a good selection of some new vegan products and obviously the usual fruits and vegetables just be prepared to pay more than you’re used to. Bonus is the cheapest grocery store in Iceland, and has my faaaavorite vegan veggie wrap. Many gas stations will also have Subway, smoothie bar or small cafe with vegetarian options. Obviously, there are more options for specific restaurants in Reykjavik, and more difficult to find good options outside of the city. My personal favorite pizza place in Reykjavik, and they have vegan pizza! WIN. Lots of options for vegan treats plus a delicious juice bar. This cute cafe is located at the intersection of Laugavegur and Skólavörðastígur so you can’t miss it when you’re heading up to Hallgrímskirkja. They make delicious crepes with vegan filling options. Yum! Indian street food so if you’re looking for a full flavor spicy meal, this is the place to go. Helloooo hummus! This place has simplicity and deliciousness down to a science. The Thai inspired vegetarian soup with rice noodles in a deliciously flavored broth. You don’t want to miss this place, the heaping bowl of goodness will warm your belly and your soul. Adorable cafe serving coffee, vegetarian chili, and a vegan carrot cake. You didn’t think I was going to make a list of places to eat and not include an ice cream place, right?! Joylato is awesome – not only do they have an adorable shop with friendly service, but they have delicious vegan ice cream! Glo is my go-to place if I’m eating out. Everything from the menu to the decor is exactly what I look for in my food choices. Their food is all organic and prepared using minimal ingredients. The menu is simple with options for gluten-free, vegetarian, vegan, and raw. Location: The easiest location is on Laugavegur, but they also have a spot in Skeifan which is connected to a huge health food store. If you can make it over there, you will be able to find some real vegan/vegetarian gems! They have a full vegan menu with great vibes, plus choose from oat, soy, almond, or coconut milk for your coffee. Salads, smoothies and fresh pressed juices – this is the ultimate healthy stop! Well known restaurant in the city, offers a vegan breakfast plate. My friends at Arctic Adventures wrote a huuuuuge blog post with a great list of vegan restaurants in Iceland – read it here! 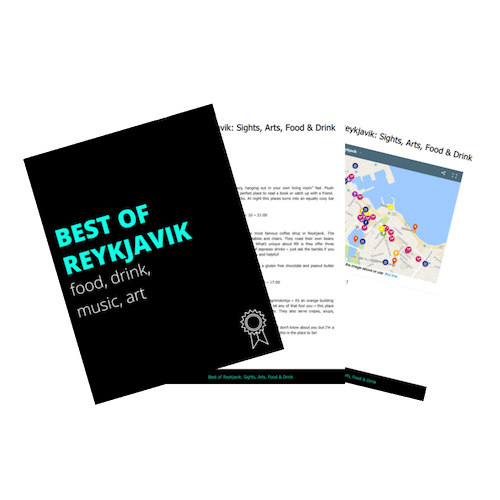 Get your FREE Reykjavik eats on a budget guidebook! 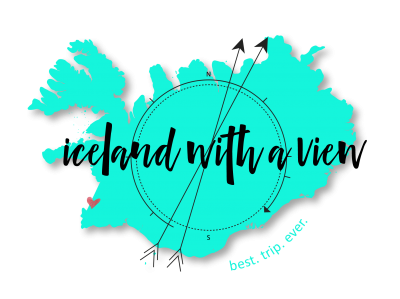 Iceland Planning – The COURSE!